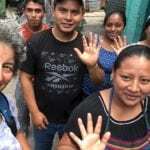 As a recipient of a scholarship from the Friendship Fund, I was recently fortunate to travel to Guatemala with a group of educators on a Digital Storytelling program run by Peaceworks Travel. This organization was founded by a history teacher just after 9/11, who felt it vital to find a way to build bridges, not walls. Peaceworks’ mission – “to enable travelers to engage in meaningful adventures designed to foster critical thinking, empathy, and innovative solutions for a more peaceful world” – is close to my heart! 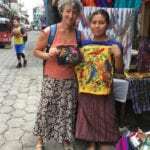 We visited Antigua and Lake Atitlán, two places frequented by both tourists and many others, who after experiencing Guatemala decide to stay and form, or become part of, one of the many NGOs (non-governmental organizations) that do solid work to foster sustainability within these indigenous communities. 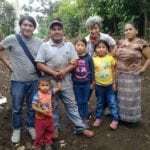 Guatemala went through genocide in the ’70s – ’80s (why this is still little known is a whole other story) and much of the population is still recovering. Our Digital Storytelling instructor was Los Angeles documentary filmmaker and media arts teacher Michael Hernandez, who has made many award-winning films of his own, as well as guided student work. He provided me and the other educators insight and personalized hands-on training on how to utilize digital technology to get to know the people and culture and develop questions to bring out personal stories. The only tools required were our mobile phones, iPads, and/or computers. The idea was for us as educators to learn the techniques of filmmaking on these devices and to then bring this knowledge back to use with our own students. We met and interviewed a variety of people, some pre-arranged, and others spontaneously based on the day’s itinerary. 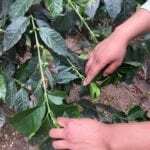 We met and toured coffee fields, interviewed farmers who worked with De La Gente Coffee, a farmers’ cooperative that creates economic opportunity and improves the lives of these famers and their families. 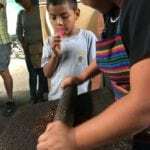 Not only did we visit the fields, but also after picking coffee beans, we prepared the beans, roasted them over a fire, ground them using mortar and pestle, and then drank a cup – literally the freshest cup of a most delicious coffee one could ever have! We visited the David Lamotte Preschool in Santiago de Atitlán and were able to meet with students and teachers. The students were learning in both their native Mayan language Tzu’tujil (Tzoo- tu-hil) and in Spanish. 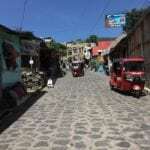 Literacy rate in Guatemala is improving but is still one of the lowest in the world. The Mayan population suffered during the almost four-decade civil war. Much of the work now is focused on youth and improving lives so that next generations can prosper. Students at this school are engaged, yet have little. When the teacher wants her students to write, each is called to retrieve his or her own pencil, one at a time, from a personal backpack. 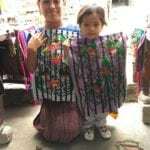 Seeing this, we obtained a supplies list from the teacher, which we fulfilled at a local store before leaving the town. A little help, but certainly our hearts were touched. 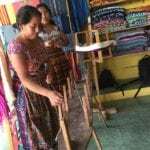 As well, we spent time with a group of women who run a women’s weaving cooperative in San Juan de Atitlán. These women use plants to make their own dyes and grow the cotton to later weave fibers on hand-made looms, all to create brilliantly colored scarves, clothing, handbags, and much more. The cooperative, according to those we interviewed, brings greater income, as there are now sales directly from weaver to consumer. As one of many educators who did not grow up using digital technology, it can be a challenge as to how, and whether, to incorporate these modern devices into the classroom. Digital Storytelling provides a framework to address this issue. These technological devices are not going away; to use them purposefully in the classroom without their being simply a distraction is a teacher’s dream! Digital Storytelling is a brilliant concept that takes advantage of the positive aspects of this technology, accessing many areas of learning, including journalism, filmmaking, communication skills, and artistic expression. As someone who has traveled quite a bit, yet not very savvy with technology, I am thrilled to have this new skill. It adds depth to travel and the ability to capture real stories about real people. This is definitely something I will be using with my own students, in the classroom and out in the world. This year at the school where I am co-founder and educator, CT Experiential Learning Center (CELC) Middle School in Branford, our theme is Heritage, Ethnicity, and Quest for Freedom – a rich avenue for digital storytelling! Interested in travel? 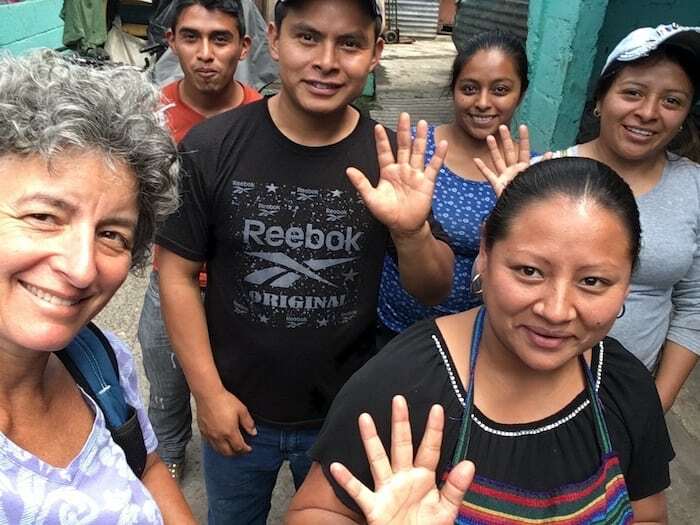 For information about Summer 2019 Adventure with CELC and Peaceworks, contact Melinda mandm@CTExperiential.org or 203.433.4658.